In 2016 the German Luftwaffe celebrates its 60th anniversary. 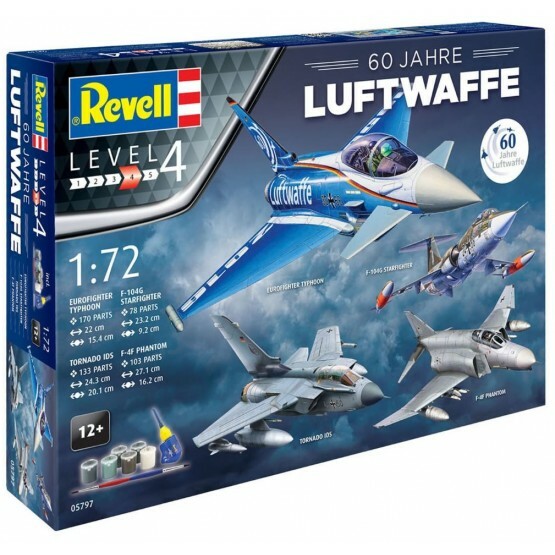 To mark this anniversary Revell is bringing a gift-set onto the market containing the main types of aircraft flown by the Luftwaffe. The set contains the construction kits of the Euro Fighter Typhoon, Tornado, F-4F Phantom and F-104G Starfighter in 1:72 scale. In addition the kits basic colours, brushes and glue are also included.